Platinum is sold for around $840 for an ounce today. It wasn’t like this always. In the last 20 years, the price of platinum reached a low level of just $350 but was also on the highest point of $2070. Unlike gold and silver, platinum is more likely to suffer big price differences in a year. However, platinum coins do have a value that’s for sure. In order to know more about what kind of value we’re talking about, you need to learn more about the history of platinum. Platinum was first used in coins in the time of Spanish America. Platinum coins were used as a fraud because they look like silver coins which were then more valuable. The officials that confiscated the platinum and silver mi of coins melted them down and threw away the platinum into the sea. Learn more about the history of platinum on the following link. Pure platinum coins used to be made as test coins. However, they never had the purpose of payment coins. The only country that used platinum coins as payment was Russia from 1828 until 1845. The Russians realized they made a mistake because platinum is really hard for minting and the platinum coins really look alike silver coins. So they ended this project. From the year 1983 platinum coins started production as numismatic material. 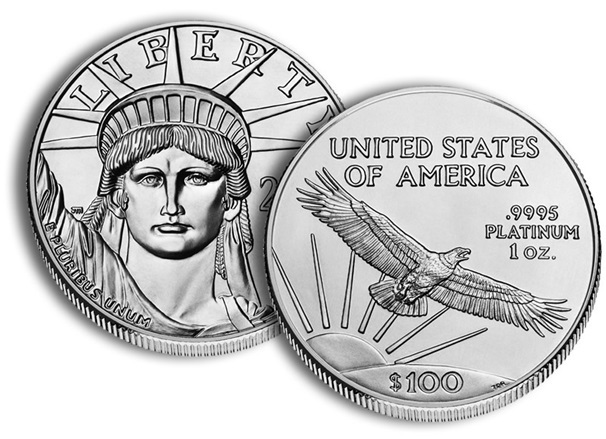 The USA also began minting platinum coins as of 1997. Today, people buy them for investment reasons too. In numismatics, the most valuable coins are the ones that are rarest. As mentioned, platinum coins were made as test coins for gold and silver coins and that’s why these coins are so rare. Collectors would love to have them in their possession but since there are so few in the world, that’s nearly impossible. However, not all platinum coins are rare. There are lots of coins coming from Russia from the period when they used them as a payment method. They have the value of the platinum but also have historic and numismatic value. Expect the price of these coins to be higher than the platinum bullion. As of 1977 more big countries started producing their own platinum series for numismatic purposes. Some of these coins gained big popularity over the years and the coins are being sold daily. Australia, China, USA, Canada, Great Britain, Russia, all have their own platinum coins. Some of the most famous are the Australian Koala, the American Eagle, the Chinese Panda, and others. Australia is a land famous for its mining. There aren’t too many mines for platinum, but the Australians have big respect toward mined resources. The Australian Platinum Koala is among the first platinum coin series in the modern world. They started producing in 1988 and ended the series production in 2010. The American Eagle started production in 1997 and gained instant popularity. The coin is still in production today. Four different denomination are being produced, 10, 25, 50, and 100 dollars. The 100 dollar coin weights just a little more over an ounce and is worth today around $1000. From 1987 until 2005 the Chinese Government minted platinum coins with the face of a big Panda on the rare side of the coin. They minted 13.750 ounces of platinum since the beginning until 2005 when they ended production mainly because of the fast-rising price of platinum. Most of the coins, especially those from the beginnings are very rare. They were either melted back or are simply lost and in possession of people who don’t know their true value. Before the Olympic Games in Russia in 1980, the Soviet officials minted more platinum coins as a part of the marketing campaign for the games. The coin was first released in 1977 and had more different designs for coins with different denominations.